Learn about the risks and practices of secure cold storage and transportation of cryptocurrency in this whitepaper from Lowers & Associates. This slideshow sheds light on emerging risks CIT carriers face as they look to expand their banking relationships to handle ITM servicing. 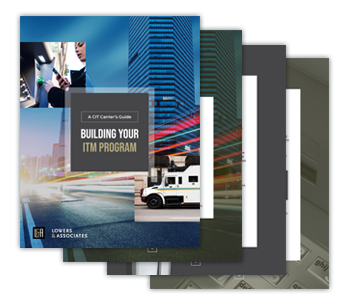 This guide tackles the essentials for CIT carriers navigating the adoption of ITMs, mitigating the challenges that accompany it, and capitalizing on the opportunity it brings to expand into new markets. The Lowers Risk Group team has a long history of serving crime and fidelity insurance underwriters and brokers operating across the globe. We offer a range of services to help remove or defray risk, prevent and identify fraud, and verify claims. It is paramount for CIT operators to proactively address this rising threat. In our latest infographic, we present the most up-to-date research on armored car robberies and offer 8 ways to combat the threat of violent robberies. Our latest slideshow features 18 facts straight from the ACFE’s bi-annual Report to the Nations on Occupational Fraud and Abuse. Slideshow: What Makes a High Reliability Organization? HROs have the unique ability to deliver stunning reliability in complex environments. How do they do it? What makes an HRO? Our latest slideshow provides a glimpse inside. This infographic gives a fast summary of the characteristics of an HRO. Managers of every organization should be familiar with HROs to evaluate how they might adopt operational and cultural factors that lead to very high reliability to their own environments. In this whitepaper, we summarize the remarkable achievements of High Reliability Organizations (HROs) and describe how these organizations deliver stunning reliability in complex environments. This whitepaper will help you understand the vital role of HR threat assessments and give you guidance on how to help keep unknown risks from damaging your people, brands, and profits. Better understand the unlikely but devastating problem, including some insight into an assailant and a typical incident, and what to do to predict, prevent, and respond if a shooting occurs. Gain an in-depth look at the complexities of occupational fraud, so you can prevent, detect, minimize, and/or recover from it. Our latest infographic outlines the dimension of this epidemic problem, how far the impact extends, and what to do to predict, prevent, and recover from incidents. Our infographic highlights the typical 3-step money laundering cycle and outlines key components of an effective anti-money laundering program. This white paper covers the fundamentals of social engineering and provides the necessary tools for preventing loss within your organization. This whitepaper covers key topics and guidelines relevant to BSA/AML compliance, including the 5 main areas of an AML compliance program. Our guide helps you navigate the treacherous social media waters and shows you how to use it as part of your employment screening process to yield better hiring decisions. This whitepaper looks at recently issued guidance from the EEOC to employers concerning the need for individualized assessments in the employment screening process. We offer a model you can follow to design a hiring process that is both fair to applicants and effective in managing your organization's human capital risk. This infographic explores the employer’s dilemma and offers advice on how you can establish background screening and hiring practices that achieve both goals. Additional levels of oversight within the financial institution and third party service providers of financial institutions have emerged since the financial crisis of 2008. This paper looks at changes to the regulations that are impacting the armored carrier industry and the financial institutions that work with them. The infographic offers brief descriptions of various background checks, ranging from basic employment and education verification to more technical public records searches. These multi-layered, multi-year data sources can be extremely valuable for employers who know how to make use of them. This infographic helps pull the pieces of a model background screening process together in one place. It can be adapted to your HR hiring practices and will help your organziation comply with the essential requirements contained in the EEOC's guidance. In this whitepaper, we delve into forces at work expanding the role of HR in enterprise risk management (ERM). We look at how an organization’s human capital risk management (HCRM) practices must evolve in order to protect people, brands, and profits. Human capital risk is a significant part of the Enterprise Risk Management puzzle. This whitepaper explores how employers can identify and mitigate the four most important employee-related risk factors within a comprehensive ERM framework. While an extended workforce can offer many benefits, it also brings clear risks that many organizations unfortunately fail to properly manage. This 12-page guide explores key topics associated with risk management and employment screening for an extended workforce. Data mining is used to detect fraud by identifying patterns across multiple disciplines and databases. Watch this video to hear Mark Lowers, Founder and CEO of Lowers & Associates, discuss the role of data mining. The Fraud Triangle model, developed by famed criminologist Donald R. Cressey, is useful in understanding the circumstances and rationale behind occupational fraud. How can the damaging acts of an employee be explained? This presentation offers strategies for managing human capital risks while you drive compliance, enhance workplace safety, increase productivity, boost overall organizational performance, and reduce occupational fraud. If your organization has crime exposures, you need to understand occupational fraud and the methods proven to mitigate it. This presentation explores many facets of occupational fraud management and crime insurance.